Shane Megonigle, who taught for 18 years at the old Ethan Allen School for Boys, addresses DOC officials. Photo by Jabril Faraj. Attendees expressed frustration during a community forum on juvenile corrections reform and youth recidivism at what they said was a lack of transparency and action on the part of state officials. 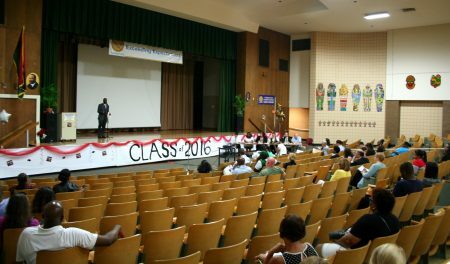 The forum, held at the Business and Economics Academy of Milwaukee (BEAM), 3620 N. 18th St., was convened by District 10 State Rep. David Bowen in response to conditions at the Lincoln Hills School for Boys and its sister school, the Copper Lake School for Girls. The juvenile detention facilities, both in Irma, Wisconsin, are involved in a federal investigation over allegations of abuse, child neglect, sexual assault and other crimes. Brandy Bond, an attendee who spent a year at the old Southern Oaks Girls School when she was 13, stormed out of the forum after being told that she would not be allowed to ask questions of the Department of Corrections (DOC) officials present at the event. Bond, who started smoking marijuana after witnessing a shooting at the age of 12, was sentenced to two years at the facility where she was subjected to eight days of “23-hour restriction,” which involves solitary confinement for all but one hour of the day. A small crowd attended a community forum on youth incarceration reform and recidivism. Photo by Jabril Faraj. “I feel shut out, just like I’ve always felt, because I bet I’m the only person in the room that has ever been on 23-hour restriction,” said Bond after she left. “I feel like there’s a problem with Representative Bowen’s thinking, that he thinks the elected officials are more important than the actual community,” said Bond, who is running for state assembly in District 16. Local legislators Chris Larson, LaTonya Johnson, Evan Goyke, Jonathan Brostoff, Fred Kessler and JoCasta Zamarripa also attended. After Bond walked out, DOC Division of Juvenile Corrections Administrator John Paquin and Division of Community Corrections Region 7 Chief Luann Anderson answered a handful of questions from the crowd of about 40 people. “You know how to talk to the public, but you know you’re handing us a lot of hooey,” said community member Cecelia Collins, addressing the DOC staff. Paquin was not able to answer a number of the questions posed. He started the job in January, and was previously an assistant administrator with DOC’s Division of Adult Institutions. 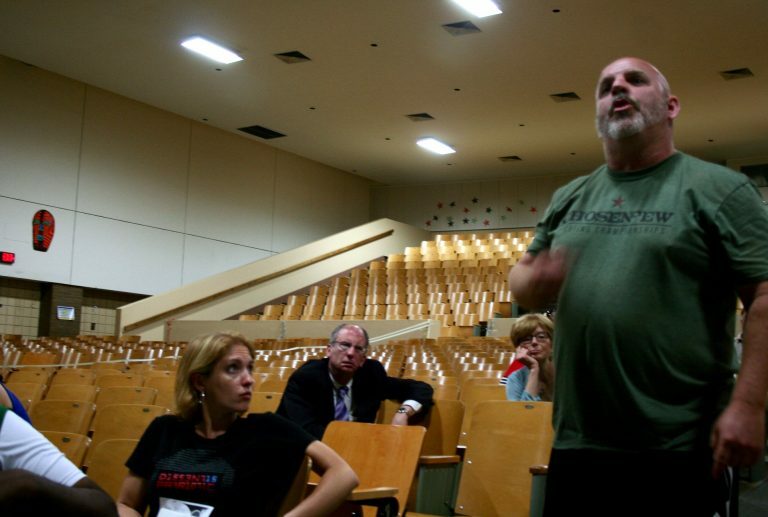 Shane Megonigle, who taught for 18 years at the old Ethan Allen School for Boys, another juvenile detention facility that was closed in 2011, called the forum a “smoke and mirrors” game. Megonigle said he wrote Larson’s office in 2011 about “the abuse in corrections” and spoke with the state senator’s assistants but was never granted a meeting. Verona Swanigan, a candidate for Milwaukee County District Attorney, said the community feels silenced when it doesn’t get real answers. “After a while, the public stops showing up when you refuse to actually be transparent,” she said. Lincoln Hills has been immersed in scandal since a state probe began late last year. A coalition of nonprofits, Youth First!, has called for closure of the facility, which is also being investigated for a possible pattern of civil rights abuses toward inmates. “What we’re seeing [are] the symptoms of a deadly disease that has been brewing in our city … for decades,” said Wisconsin Jobs Now Executive Director Martha De La Rosa. De La Rosa said that when jobs are not available, that can create a lack of hope, which she said leads to increases in crime and recidivism. Milwaukee’s poverty rate of 29 percent is almost twice the national average. In addition the city has one of the lowest employment rates for African-Americans, and particularly black men, in the nation. Forty-two percent of Milwaukee children grow up in poverty. But Milwaukee County Deputy District Attorney Joseph Kenney said that isn’t enough. “If they really want to focus on evidence-based best-practice, then what this state needs and what our community needs for our children are small, residential treatment facilities,” he said. Anderson said DOC is “systematically reviewing all models that are available,” regarding a possible facility closer to Milwaukee. In 2011, Gov. Scott Walker closed the Ethan Allen School for Boys and Southern Oaks Girls School, located in Delafield and Union Grove, respectively, in an attempt to balance the state’s budget. It was said the closings would save more than $23 million a year. Juveniles from both facilities were transferred to Lincoln Hills/Copper Lake. “The problem is when you starve the system that’s supposed to deal with rehabilitating these children and you don’t provide the resources that they’re supposed to get, the only thing that you’re doing is giving them a clear path into adult recidivism and crime,” said Johnson, a state representative. Johnson said there are more than 130 children awaiting pre-trial sentencing at the Milwaukee County Juvenile Detention Center and that the 120-bed facility is so crowded children are sleeping on the floor. Kenney said there needs to be reform throughout the system and that agencies have to work together to identify children who are at risk to commit crimes. He called resorting to incarceration “a failure for everybody,” adding that a criminal record harms an individual’s ability to lead a productive life. Swanigan suggested alternatives such as boot camps, and art and music therapy, which she said African-American youth will be more likely to respond to than traditional therapy and treatments. She also proposed a program that would work proactively with schools to screen, identify and engage children who underachieve academically, or exhibit disciplinary or truancy issues. “I want to … get these kids back on track to where they should be educationally, because, once we get them back on track educationally, now we can start focusing them on careers versus crime,” Swanigan said. -Megonigle said he wrote Larson’s office in 2011 about “the abuse in corrections” and spoke with the state senator’s assistants but was never granted a meeting. – So he spoke to Brostoff most likely and received the typical Brostoff Brushoff treatment. I can’t wait for the next meeting. I have a lot of questions I want to ask, I’ll bet they don’t get answered.